From the Strangest Thrill-Drama in All History! “Delinquent in Outer Space” at Pappy’s Golden Age Comics Blog. Last night was the first session of the Vaults of Ur. It went pretty well. A wee party of three set off into the ruins: Aditi the Thief, Kris the Fighter, and Meya the Outlander. They reacted to the weird with appropriate paranoia and killed things. Loot was light, molotov cocktails were fumbled, but they all came back alive even if Aditi had to be carried out. 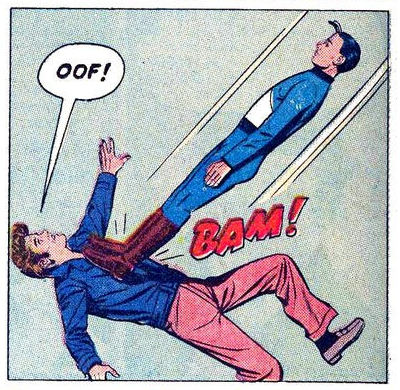 The stupidity of 1950’s comic books meets the idiocy of 1950’s SF. I lived through both (lost my mind in the process but what good was it doing me?)!! You can bet you’ll be seeing more panels from DELINQUENT IN OUTER SPACE.